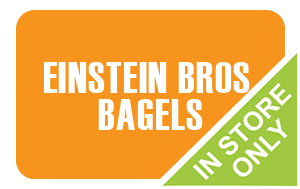 If you like bagels, then you’ll love a discounted Einstein Bros Bagels gift card. If you love bagels, then this card is your ticket to absolute bagel happiness! And don’t forget, gift cards make outstanding presents too! Why not give the gift of bagels to that special someone in your life? And guess what? You’ll pay less money for it! What started in 1995 as a quick breakfast shop has turned into a national bagel phenomenon. In fact, as of 2012, there were 773 locations nationwide, and true bagel fans had been born from coast to coast. Purchase your discounted Einstein Bros Bagels gift card today and start saving money immediately on all your favorite bagels, sandwiches and sweets! So, what are you waiting for? Grab a card and grab a box of bagels today! Your discounted Einstein Bros Bagels gift card will save you money on bagels and sandwiches for breakfast, lunch and even catering! Choose your bagel flavor from 24 options then match it with the shmear spread of your choice. Take your time choosing, because there are eleven shmear flavors, as well as addition toppings- so the combinations are endless. But no worries! With your discounted card, you can experiment all you want, while paying less! For added savings, join the Shmear Society and receive free items you’re sure to love! Not only will an Einstein Bros Bagels gift card save you money, but you can also buy many other discounted cards from Cards2Cash. We carry gift cards for restaurants, retail stores, gas stations and more! Be sure to check out our listings for Duncan Donuts, Schlotzsky’s, Krispy Kreme, Jason’s Deli and more! With Cards2Cash; you can eat the food you love and still save money! Do you have an Einstein Bros Bagels gift card you aren’t going to use? Cards2Cash will buy your unwanted gift card! We pay the highest percentage rate possible for gift cards to restaurants, Clothing stores, hardware stores and more. If interested, stop in one of our retail locations for immediate payment for your card OR fill out our simple online form and we’ll get back to you with an offer for your card. Cards2Cash is your place for saving money!